Do you know twitter? The most popular mini-blogging website? If you do not know about it, go http://twitter.com and find out! Have you been using tweetdeck, one of the devices used to connect easily to twitter from your computer? Well, tweetdeck has a number of features, from refreshing itself and notifying you, to switching column places. But it has one disadvantage, that is, much usage of computer memory. If you are using twitter and want your computer to boost up a bit, twitteroo is for you! 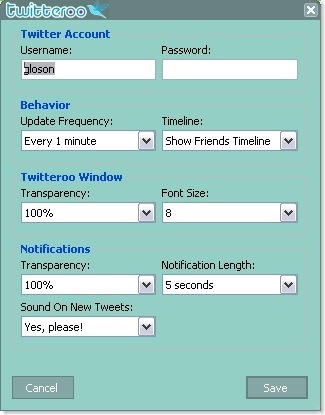 Twitteroo has similar features compared with tweetdeck. One similarity is refreshing itself and notifying you. But twitteroo is much faster compared to tweetdeck. But twitteroo only shows a column, that is, your timeline, or the public timeline. 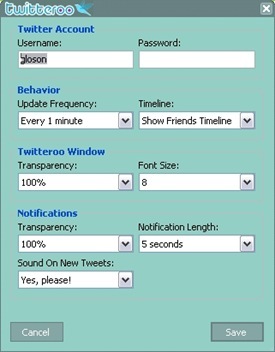 Here are some features of twitteroo. Twitteroo also lets you choose how long the notification will stay, and whether to sound or not. You can also choose the transparency for the main window and the notification. You can choose how often it refreshes, ranging from one minute to one hour. You can choose to display the public timeline in the main window, instead of yours. 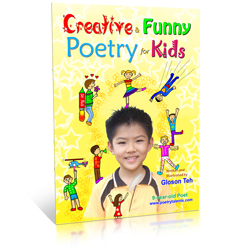 There is a link to the twitter-er’s website. The profile images are cached and therefore need not load again. And a few more features…. Here’s a screenshot of it. Green: Link to twitteroo’s home page. Red: Profile image and link to twitter profile. Light Blue: Profile real name. Yellow: Link to twitter’er’s personal website. Pink: How long ago the tweet is tweeted. Black: Text area for tweet. 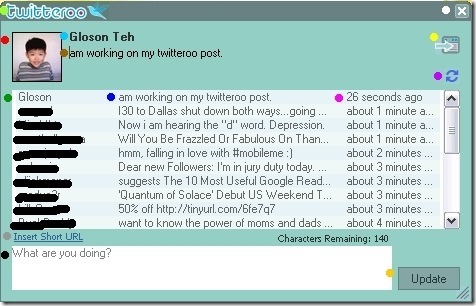 the twitteroo icon in the taskbar and then click ‘Exit’ in order to close the program. If you click settings, this window will appear. That’s where you could modify the settings. To sign out, simply clear your username and password and click save. However, the tweets would still be visible, but not updated. So, it’s best to install twitteroo if you have a slow personal computer. 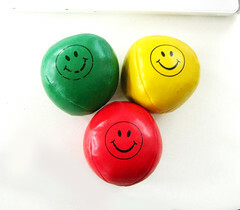 Why not try twitteroo now, and see how you like it? Unfortunately, twitteroo was not updated for almost a year, according to its blog, probably because no many people uses it. Update: I’ve installed twhirl client. And found it better than tweetdeck – faster, and more features (I think). So, to those who owns fast computers, twhirl is for you. 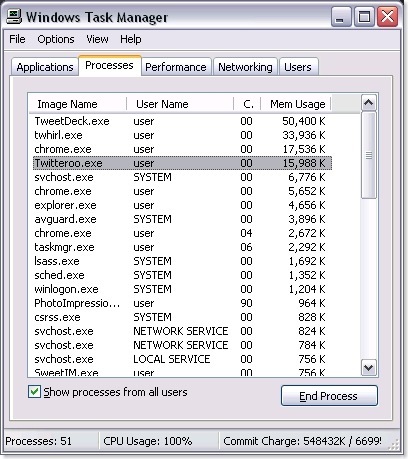 Have you ever been wondering why when tweetdeck is running, your computer seems ‘sleepy’? 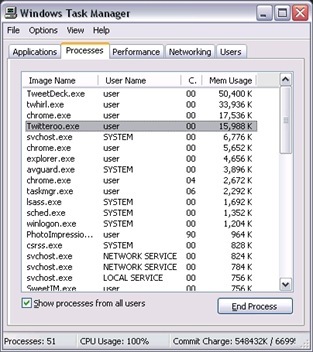 Here is a screenshot of the memory usage by task manager. See? Tweetdeck is suuuuure slooooooow. Twhirl is faster. Twitteroo is even faster. Whoa! Faster than Google Chrome! However, firefox takes up loads of memory (sometimes up the 200,000 K! ), which is a reason you should install chrome. So, which client do you choose to install, well, it’s up to you. If you want your computer to boost up a little bit, install twitteroo. If your computer is fast enough, twhirl is here! To make it short, which do you install depends on your choice. - the choice is up to you. By the way, twitteroo rhymes with kangaroo, I love you, Dr. Who, smelly shoe, stinky poo, to the loo, blah blah bloo – Up to you! Update (23/11/08) : I’ve added a poll here, pleas vote!